Handle material made of high-grade resin black. Handle Material - High-grade resin. High-grade resin is a high-quality synthetic material, the surface of which is processed and refined separately. The material is ideal for exclusive accessories and writing implements because it facilitates a broad spectrum of modern and classical designs in many attractive colours. The material is corrosion-resistant, very long-lasting and has a luxurious, alluring lustre. When contrasted with this, the colours and shapes of other premium materials are shown to their very best advantage. The Razorhead - Gillette® Mach3®. 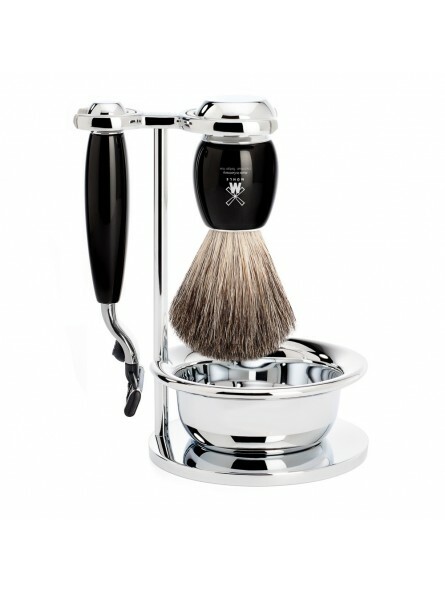 The Gillette® Mach3® system is one of the most frequently used shaving systems in the world. Three progressively spaced blades guarantee a comfortable and close shave. The blades are available from retailers everywhere. 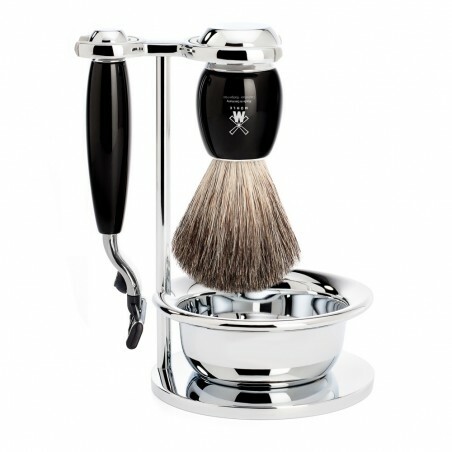 Wet shave razors from MÜHLE are compatible with the systems Gillette® Mach3® and Mach3® Turbo.